Listen, Google, we need to talk. You seem to be ignoring our green robotic friend. I know you've been battling lawsuits, getting your self-driving cars licensed, and focusing on Google+, but it might be time to show Android that you still care. Your neglect is starting to show for those of us who depend on Android. 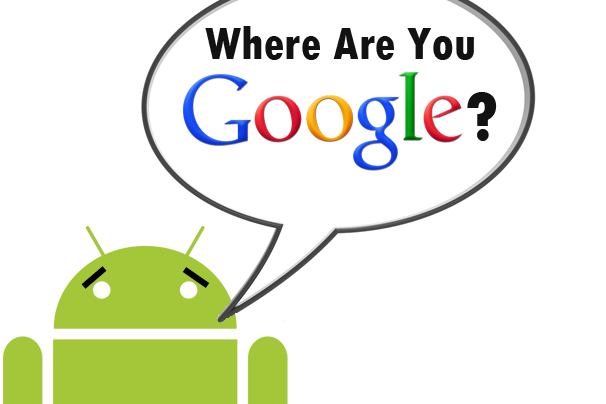 Lately, finding apps in the Google Play store has been harder than usual--even popular apps can be difficult to locate at times, and it's worse if the user is searching for tablet-specific applications. App makers are feeling lost, with no one to guide them through the perils of making an app that works on multiple Android devices. And sometimes it feels as if the carriers and device makers have more control over Android than you do; they dictate how the OS looks, what it can run, and whether a phone or tablet will receive an update to the OS. What happened to you, Google? It has been nearly seven months since your last major Android announcement, and some of us in the community are worried that Android will go the way of Google Wave: You might stop work on the platform, and leave development to any interested parties. Your own CEO said recently that Android isn't a crucial component to Google's business strategy, which makes sense since Google makes more money off iOS than it does off its own mobile operating system. But even if Android doesn't bring in big bucks, we all know that the OS is an important part of your business, and it won't do anyone any good if you let Android wither. So maybe it's time to rethink your Android strategy. Where Are the Good Apps? 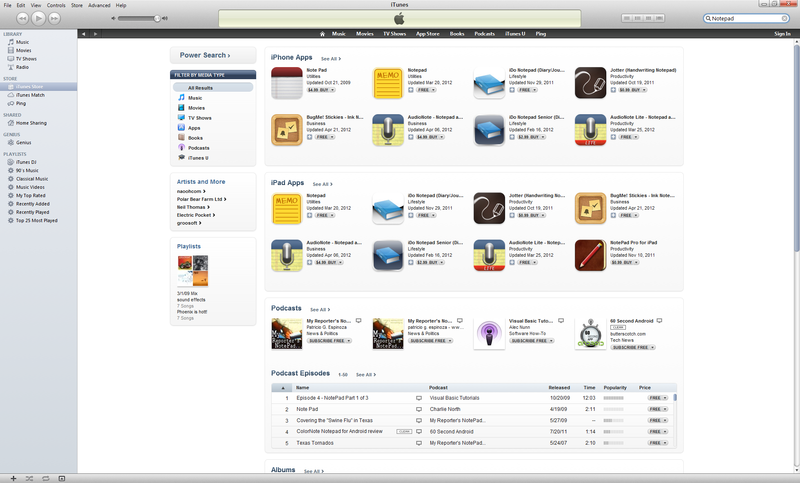 Searching for an app in iTunes. For starters, let's look at how you handle apps. Unlike Apple, you chose to let virtually anyone create an app and make it available for download via the Google Play store. Not only has this approach opened the door for malware in the past, but it has also allowed all sorts of terrible and useless applications to flood the store. Trying to find an app in the Google Play store is akin to navigating New York's sewer system while blindfolded: People have no idea what they're going to find, and they might run across some pretty unsavory things. You're famous for your search capabilities, so why is it so hard to find anything of value in your app store? 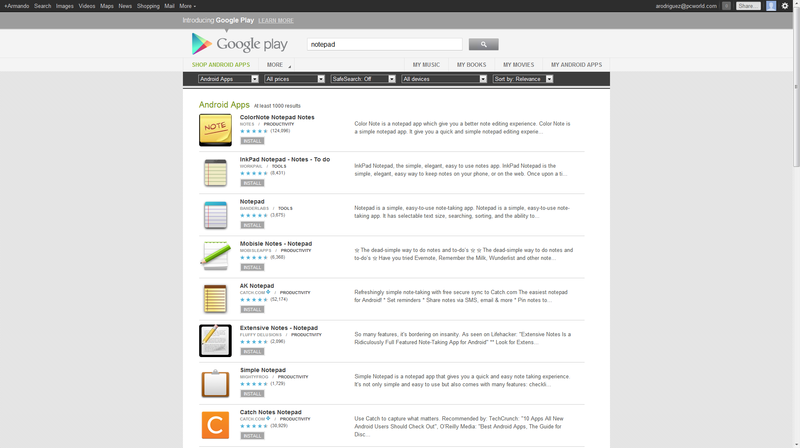 Searching for an app in the Google Play store. Users hunting for Android tablet apps encounter even more trouble. Such apps are so few and far between that it's nigh impossible to find one. The iPad is so popular in large part because the Apple App Store contains tens of thousands of tablet apps that are easy to find. When users search in the App Store on iTunes, they can easily tell which apps work on the iPhone and which apps were designed for the iPad. In contrast, when users search the Web version of the Google Play store, they have no way to tell whether an app is optimized to work on a tablet. Even if users search the Play store on an Android tablet, chances are good that the app they download will just load the mobile phone version stretched out to fit on a larger screen. Why do so few genuine Android tablet apps exist? One reason is that Android tablets aren't selling well. But it's also true that developers feel they aren't getting any support. Compared with the iOS and Windows Phone 7 software development kits, the Android SDK can be a pain because it utilizes Java. Although Java is a basic programming language that most people learn in Computer Science 101, it's difficult to work with, and it can prevent Android apps from looking as good as (or better than) their iOS counterparts. Another headache for Android developers: They have to create apps that can run on more than a thousand different devices, all with different processors, screen sizes, resolutions, and versions of the OS. It also doesn't help that the Android Developers' forums shut down last August, leaving many developers with nowhere to go to find solutions to their problems. Most app developers aren't making any money off Android, and some developers have quit the platform, calling it "unsustainable." While Android is unlikely to run out of developers anytime soon (it still has the largest smartphone market share in the United States and most of the world, after all), we may begin to see a drop in the quality of apps as better developers abandon ship. We users would then have to wade through even more junk before finding an app that's worth downloading. Google Wallet is available only on a select few phones. Even more frustrating is the fact that once we find a worthy app, we may not be able to download it. Lately carriers and manufacturers seem to be dictating which apps users can and cannot have on an Android phone or tablet. Take Google Wallet, for example: Users who are not on Sprint cannot install the Google Wallet app on their phones--even if they own a Nexus, which supports that near-field communication payment app. I don't like having carriers tell me what I can and cannot do with my phone, especially when it comes to apps. Manufacturers may not have as much of a say when it comes to what we can install on our phones, but they do determine what we can and can't remove from our handsets. Ugly overlays and annoying bloatware plague nearly every Android device. Most of it we can't remove unless we root our devices. To push all these unwanted extras onto our Android devices, manufacturers tweak and alter the OS--distorting the way it looks and behaves. Carriers, too, play the bloatware game, sometimes going so far as to replace all of the Google services with Bing instead. Even worse, these customizations make it harder to update phones and tablets to the latest version of Android. Even the Samsung Galaxy Nexus, a phone that's supposed to have the most up-to-date version of Android, carries a different operating system depending on which version a person purchases. The Sprint, Verizon, and unlocked versions all receive updates at different intervals, and are all running different versions of Ice Cream Sandwich. I'm still waiting for the performance-enhancing 4.0.4 update to become available for my Verizon Galaxy Nexus. That update supposedly fixes several critical bugs--and it has been available for well over two months for the unlocked Nexus. Look, Google, I'm not advising you to try to control the types of Android phones and tablets that companies make. But you can take two steps to ease the burdens on app developers and make things better for people buying Android devices: Set a minimum hardware requirement for phones and tablets running Android, and play a larger role in distributing updates. If you were to set a minimum hardware requirement for all phones and tablets, developers would be able to design their apps for those parameters and be sure that the apps will work on any Android device. The device makers, we hope, would still design phones and tablets that sit well above the minimum hardware requirements, and you could raise the requirements once every two years to match the hardware that most people were currently using. In this way, you would prevent manufacturers from creating cheap devices with ancient specs. This also means Android users wouldn't have to guess whether an app will work on their device. Tablet users would benefit too: Development teams wouldn't have to spend as much time fiddling with the various phone versions, and could spend more time optimizing their apps for Android tablets. Hardware is one thing, but making sure that everyone is on the same version of Android will be a bigger challenge. Google, by working more closely with HTC, Motorola, Samsung, and the other major makers of Android phones and tablets, you can take a step toward a more unified Android experience. Become friends with the carriers and chip makers in order to ensure that an update will work on a carrier's network, so that they won't have to spend several months testing an update before finally deciding to roll it out. The biggest delays to Android updates come from carriers testing the updates on their networks, a process that they could expedite with your help. Google, we all love Android and want the best for it. We just wish you showed as much interest in your own OS as we did.